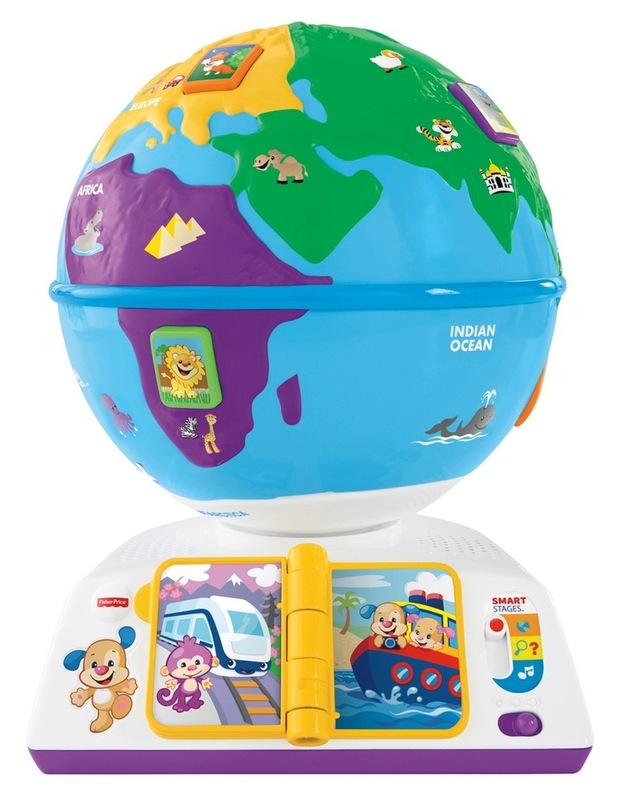 With this interactive globe, little ones can hold the whole world in their hands and take it for a spin. Pressing the 7 animal buttons on the globe introduces budding explorers to the continents, animals, greetings and music theyll find along the way! When they flip the travel book pages, theyll learn how Puppy & Sis travel the globe. And when they spin the globe, theyll hear fun songs & phrases all about exploring new places. There are over 100 sounds, songs, tunes & phrases to make learning about the world fun and interactive for your toddler! Every toddler learns & plays in different ways. Smart Stages technology lets you select the stage thats best for your child on any given day! Switch up the level to switch up the learning fun, and offer up a different variety of phrases, songs & sounds for your little one! Smart Stages Technology Level 1-Learn: introduces your little one to global greetings, animals & animal sounds. Level 2-Engage: simple questions prompt baby to find animals around the globe. Level 3-Imagine: fun songs about traveling the world encourage early role play.